« Lowry’s Residency at Spike Hill Starts Tonight! Tonight Engine Room is all over NYC. The Bloodsugars will be at Cake Shop for the last night of friends Savoir Adore’s residency. The great folks over at Brooklyn Vegan previewed the show and kindly said “The Bloodsugars make ’80s-inspired widescreen pop that at times sounds uncannily like Prefab Sprout — and good Prefab Sprout, not ‘hot dog jumping frog Albequerque’ Prefab Sprout. Which is to say these folks know their way around big pop hooks.” Read the full article here. Then over at Spike Hill in Williamsburg it’s the 3rd night of Lowry’s weekly residency, and this week special guests include ERR’s Luke Wesley and friends Low Water. Check out what people are saying about the residency here, here, here and here. And for those non-New Yorkers we’ll be streaming the entire night again via StreamJam. Last but not least please save the date for the FREE Bloodsugars show at Brooklyn Bowl Wed. Feb 24th hosted by 101.9 RXP! News :: Lowry’s Residency at Spike Hill Starts Tonight! 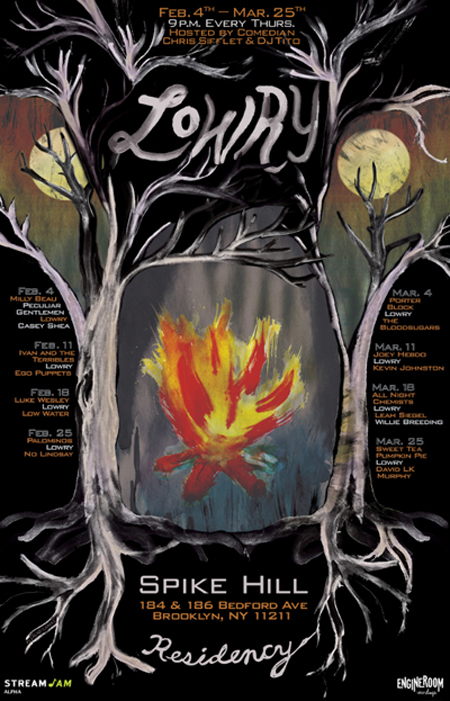 Every Thursday in February and March Lowry will be performing a free show at Williamburg’s Spike Hill. The band goes on at 10pm and each week we’ve invited different bands to play at 9pm and 11pm including Ego Puppets, Ivan & The Terribles, Low Water, Kevin Johnston, No Lindsay, David LK Murphy and many more. For a complete list visit Spike Hill or view the flyer above. For non-new yorkers, or for people who don’t like to leave their nice warm homes in the winter, we have a special treat for you. There will be live streaming of tonights show via StreamJam. A cool new service where not only can you watch live but also can create an avatar of yourself and chat with others and run around the online venue. Facebook users can sign up here or visit StreamJam and you’ll quickly and easily zip off to avatar land and battle humans as they try and take over….wait I’m getting mixed up. Anyway it’s still really cool so please give it a try.